Prokopyev was one of two cosmonauts who inspected the hole during an “unprecedented” spacewalk back on Dec. 11. This report is the latest in a months-long saga that’s long since turned weird. Scientists noticed a pressure leak on the ISS back on Aug. 29 of this year. They determined the source was a 2-millimeter hole in the Soyuz capsule and quickly filled it up with epoxy. NASA reported that the astronauts were never in any danger. Since then, photos of the hole revealed that it looked an awful lot like a drill hole. Russian authorities intimated that it could have come from “deliberate spoilage,” but stopped short of making direct accusations. Yury Borisov, deputy prime minister of Russia for Defense and Space Industry, vehemently denied trying to “[compromise the reputation] of either our cosmonauts, or of American astronauts,” according to Russian state-run news agency RIA Novosti. 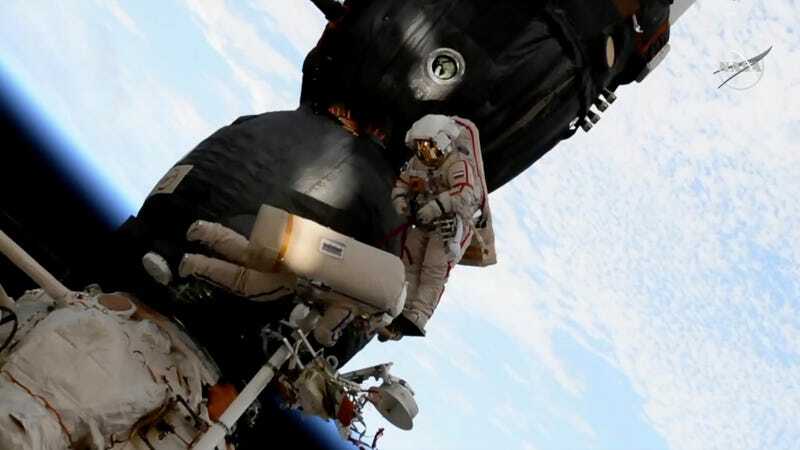 Prokopyev and Russian cosmonaut Oleg Kononenko inspected the hole in a complex spacewalk on Dec. 11, which required detaching part of the capsule’s meteoroid shield. There aren’t many more details presently—and it’s unclear whether the hole was created in Earth or space. Pablo De Leon, professor in extravehicular activities and space suit design at the Department of Space Studies of the University of North Dakota, Grand Forks, told us in September that microgravity would have made it exceedingly difficult to drill such a hole in space. An indeed, Prokopyev said that it would be up to further investigation to determine when the hole was made. So, while this might be a new development in the story, it’s not changing much. We still don’t know who drilled the hole or when, and the investigation continues. Prokopyev denied that the hole could have been drilled by an astronaut. We’ve reached out to NASA for comment and will continue to keep you updated on this story as it develops.